Plus2Print is a printing company with a strong online social media presence and acquires a substantial portion of its business through platforms such as Facebook and Twitter. 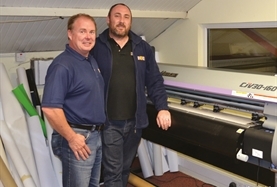 Ironically, when it came to investing in a Mimaki CJV30-100, the purchase came about through more ‘Old School’ means! Established in 1990, Plus2Print is a family business currently run by brothers, Alan and Gavin Oakes, who took over at the helm from their father 15 years ago. Between them they have degrees in business studies and fine art, backed up by experience in print and graphics and have continued to drive their Downpatrick based company forwards. 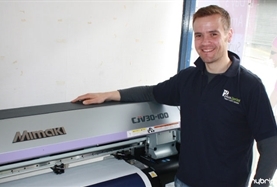 When the time came to invest in new printing technology to help Plus2Print acquire new customers and increase production, it set about researching what was currently available and fulfilled the needs of its customers. 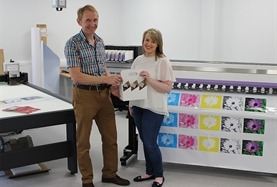 However, a chance meeting at a set of traffic lights was all that was needed to partner Plus2Print with the right machine for its requirements and budget. “We just so happened to see a Dennis D Evans van parked at a set of traffic lights and I knocked on the window for a brochure,” explains Gavin Oakes. “It really was a fortuitous meeting, as we soon found out.” Dennis D Evans, the long standing Belfast based Mimaki reseller, was able to demonstrate the speed and superior print quality of the Mimaki CJV30 integrated printer/cutter and Plus2Print had their installation shortly after. The CJV30 Series printer/cutter is an award winning integrated print and cut solution from Mimaki and offers flexibility with its four sizing options from 60cm through to 1.6m. Combining high performance with superior print quality, the Mimaki CJV30 has production print speeds of 17.5m²/h and runs with Mimaki’s SS21 fast drying, outdoor durable inks. 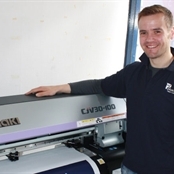 It is provided with Mimaki’s RasterLink Pro RIP software, featuring continuous print and cut, 16-bit rendering and a whole host of user-friendly machine specific tools, as well a gold warranty as standard.